37 CFR 1.103 Suspension of action by the Office. (2) The fee set forth in § 1.17(g), unless such cause is the fault of the Office. (b) Limited suspension of action in a continued prosecution application (CPA) filed under § 1.53(d). On request of the applicant, the Office may grant a suspension of action by the Office under this paragraph in a continued prosecution application filed under § 1.53(d) for a period not exceeding three months. Any request for suspension of action under this paragraph must be filed with the request for an application filed under § 1.53(d), specify the period of suspension, and include the processing fee set forth in § 1.17(i). (c) Limited suspension of action after a request for continued examination (RCE) under § 1.114. On request of the applicant, the Office may grant a suspension of action by the Office under this paragraph after the filing of a request for continued examination in compliance with § 1.114 for a period not exceeding three months. Any request for suspension of action under this paragraph must be filed with the request for continued examination under § 1.114, specify the period of suspension, and include the processing fee set forth in § 1.17(i). (4) The Office has not issued either an Office action under 35 U.S.C. 132 or a notice of allowance under 35 U.S.C. 151. (e) Notice of suspension on initiative of the Office. The Office will notify applicant if the Office suspends action by the Office on an application on its own initiative. (3) The appropriate department or agency requests such suspension. Suspension of action (37 CFR 1.103) should not be confused with extension of time for reply (37 CFR 1.136). It is to be noted that a suspension of action applies to an impending Office action by the examiner whereas an extension of time for reply applies to action by the applicant. In other words, the action cannot be suspended in an application which contains an outstanding Office action or requirement awaiting reply by the applicant. It is only the action by the examiner which can be suspended under 37 CFR 1.103. Suspension of action under 37 CFR 1.103(a) - (d) at the applicant’s request will cause a reduction in patent term adjustment accumulated (if any) under 37 CFR 1.703. The reduction is equal to the number of days beginning on the date a request for suspension of action was filed and ending on the date of the termination of the suspension. See 37 CFR 1.704(c)(1). 1.103(d) See below in “Deferral of Examination” 1.17(i) & 1.18(d) 3 yrs. from earliest filing date for which a benefit is claimed under Title 35. (D) present good and sufficient reasons why the suspension is necessary. If the requirements of 37 CFR 1.103(a) are not met, applicants should expect that their applications, whether new or amended, will be taken up for action by the examiner in the order provided in MPEP § 708, Order of Examination. 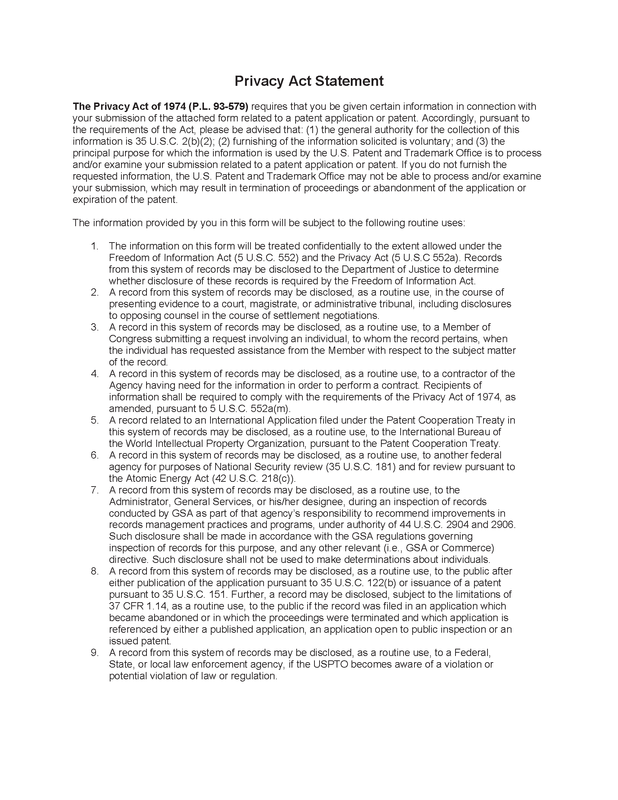 A petition for suspension of action to allow applicant time to submit an information disclosure statement will be denied as failing to present good and sufficient reasons, since 37 CFR 1.97 provides adequate recourse for the timely submission of prior art for consideration by the examiner. Pursuant to applicant’s request filed on , action by the Office is suspended on this application under 37 CFR 1.103(a) for a period of  months. At the end of this period, applicant is required to notify the examiner and request continuance of prosecution or a further suspension. See MPEP § 709. 1. Maximum period for suspension is 6 months. 2. Only the Technology Center Director can grant second or subsequent suspensions. See MPEP § 1002.02(c). Such approval must appear on the Office letter. Applicant’s request filed , for suspension of action in this application under 37 CFR 1.103(a), is denied as being improper. Action cannot be suspended in an application awaiting a reply by the applicant. See MPEP § 709. A supplemental reply will be entered if it is filed within the period during which action is suspended by the Office under 37 CFR 1.103(a). See MPEP § 714.03(a) regarding supplemental reply. Applicants may request a suspension of action by the Office under 37 CFR 1.103(b) or (c) for a period not exceeding three months in a continued prosecution application (CPA) filed under 37 CFR 1.53(d) if the application is a design application, or in a continued examination (RCE) filed under 37 CFR 1.114. The request for suspension must be filed at the time of filing of the CPA or RCE. A supplemental reply will be entered if it is filed within the period during which action is suspended by the Office under 37 CFR 1.103(c). See MPEP § 714.03(a) regarding supplemental reply. (C) the request must include the processing fee set forth in 37 CFR 1.17(i). If the Office assigns a filing date to the design CPA, the request for suspension will be processed, even if the CPA was not accompanied by the CPA basic filing fee, the search fee, and the examination fee. The suspension request acts to suspend a first Office action by the examiner but will not affect the processing of the CPA for a missing part. The applicant will be given a notice that provides a time period of 2 months from the date of the notification to pay the CPA basic filing fee, the search fee, the examination fee, and the surcharge set forth in 37 CFR 1.16(f). Applicant must pay the CPA basic filing fee, the search fee, the examination fee, and the surcharge within 2 months to avoid the abandonment of the CPA. Pursuant to applicant’s request for suspension, the action by the Office will be suspended on the CPA for the period requested by the applicant, starting on the filing date of the CPA. If the CPA or the RCE is improper (e.g., a filing date was not accorded in the CPA or the RCE was filed without a submission or the RCE fee), the Office will not recognize the request for suspension, and action by the Office will not be suspended. A notice of improper CPA or RCE will be sent to applicant as appropriate. The time period set in the previous Office communication (e.g., a final Office action or a notice of allowance) continues to run from the mailing date of that communication. If applicant subsequently files another RCE, the request for suspension should be resubmitted to ensure that the Office processes the request for suspension properly. The request for suspension of action will not be processed until the Office accords a filing date to the CPA or receives a proper RCE in compliance with 37 CFR 1.114. Applicant’s request filed , for suspension of action in this application under 37 CFR 1.103(b) or (c) is denied as being improper. The request was (1) not filed at the time of filing a CPA or RCE, and/or (2) not accompanied by the requisite fee as set forth in 37 CFR 1.17(i). See MPEP § 709. In bracket 1, insert the filing date of the request for suspension of action. If the CPA or the RCE and the request for suspension of action are proper, the Office’s technical support staff will process the CPA or RCE, and the request for suspension of action. A notification of the approval of the request for suspension will be sent to the applicant. The application will be placed in suspension status until the end of the suspension period. The suspension request acts to suspend a first Office action by the examiner. Once the suspension period has expired, the application will be placed on the examiner’s docket for further prosecution. In new applications, applicants may request a deferral of examination under 37 CFR 1.103(d) for a period not extending beyond three years from the earliest filing date for which a benefit is claimed under 35 U.S.C. 119(a)-(d), (e), (f), 120, 121, 365, or 386. The request must be filed before the Office issues an Office action under 35 U.S.C. 132 or a notice of allowance in the application. The suspension will start on the day that the Office grants the request for deferral of examination. Once the deferral of examination has been granted, the application will not be taken up for action by the examiner until the suspension period expires. For example, if an applicant files a request for deferral of examination under 37 CFR 1.103(d) for the maximum period permitted under the rule in an application that claims priority of a foreign application filed 1/3/00, the action by the Office on the application will be suspended and the application will automatically be placed in a regular new case status on the examiner’s docket on 1/4/03 (36 months from the effective filing date of the application, i.e., 1/3/00). Form PTO/SB/37 (reproduced at the end of this section) may be used to submit a request for deferral of examination under 37 CFR 1.103(d). (C) the processing fee set forth in 37 CFR 1.17(i). (E) the Office has not issued either an Office action under 35 U.S.C. 132 (e.g., a restriction, a first Office action on the merits, or a requirement under 37 CFR 1.105) or a notice of allowance under 35 U.S.C. 151. 1. In bracket 1, insert the filing date of the request for deferral of examination. 2. In bracket 2, insert the reason(s) for denying the request. 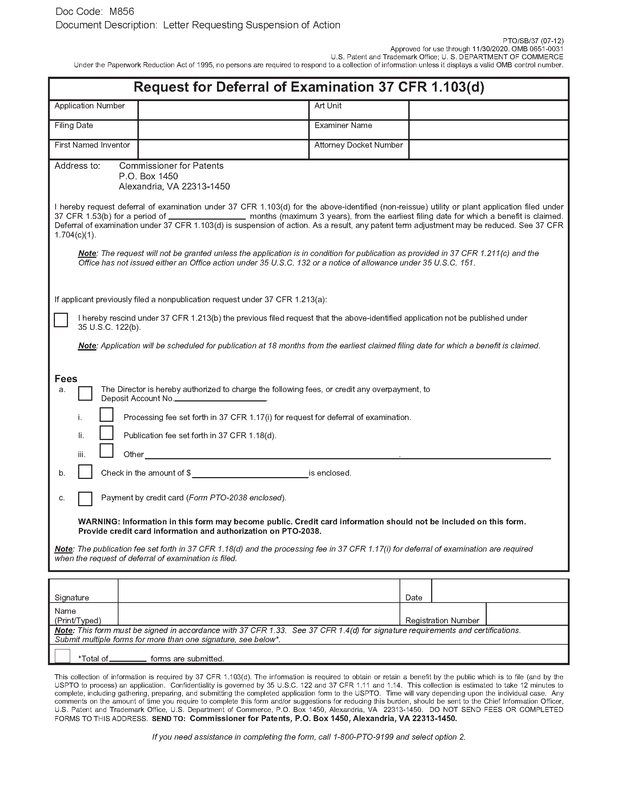 For example, if appropriate insert --The applicant has not filed a request under 37 CFR 1.213(b) to rescind the previously filed nonpublication request--; --A first Office action has been issued in the application--; or --Applicant has not submitted a request for voluntary publication under 37 CFR 1.221--. Applicant’s request filed on , for deferral of examination under 37 CFR 1.103(d) in the application has been approved. The examination of the application will be deferred for a period of  months. 2. In bracket 2, insert the number of months for the deferral. Applicant’s request filed on , for termination of a suspension of action under 37 CFR 1.103, has been approved. The suspension of action has been terminated on the date of mailing this notice. In bracket 1, insert the filing date of the request for termination of the suspension of action. Suspension of action at the initiative of the Office should be avoided, if possible, because such suspension will cause delays in examination, will increase pendency of the application, and may lead to a shortening of the effective patent term or, conversely, patent term extension, or adjustment, due to the suspension. Once a suspension of action has been initiated, it should be terminated immediately once the reason for initiating the suspension no longer exists, even if the suspension period has not expired. 37 CFR 1.103(e) provides that the Office will notify applicant if the Office suspends action in an application on its own initiative. Every suspension of action initiated by the Office will be limited to a time period of a maximum of 6 months. An examiner may grant an initial suspension of Office action on his or her own initiative, as in MPEP § 709.01 and MPEP Chapter 2300, for a maximum period of 6 months. A notification of suspension must be mailed to the applicant for each Office-initiated suspension of action, even for second or subsequent suspensions, and must include a suspension period (a maximum of 6 months). When the suspension period has expired, the examiner should take up action on the application or evaluate all possibilities for giving an action on the merits. For example, if a reference is still not available after waiting for six months, the examiner should try to find another source for the information or update the search to find another reference that can be used to make a rejection. If, in an extraordinary circumstance, a second or subsequent suspension is necessary, the examiner must obtain the TC director’s approval (see MPEP § 1003) and prepare another suspension notification with a suspension period (a maximum of 6 months). The notification for a second or subsequent suspension must be signed by the TC Director. Suspension of action under 37 CFR 1.103(f) is decided by the TC Director of work group 3640. The following form paragraphs should be used in actions relating to suspension of action at the initiative of the Office. A reference relevant to the examination of this application may soon become available. Ex parte prosecution is SUSPENDED FOR A PERIOD OF  MONTHS from the mailing date of this letter. Upon expiration of the period of suspension, applicant should make an inquiry as to the status of the application. 1. Maximum period for suspension is six months. 2. The TC Director must approve all second or subsequent suspensions, see MPEP § 1003. 3. The TC Director’s signature must appear on the letter granting any second or subsequent suspension. All claims are allowable. However, due to a potential interference, ex parte prosecution is SUSPENDED FOR A PERIOD OF  MONTHS from the mailing date of this letter. Upon expiration of the period of suspension, applicant should make an inquiry as to the status of the application. In general, examiners should not consider ex parte questions which are pending before the Office in inter partes proceedings involving the same applicant. This situation may arise when at least one application or patent of the same applicant that is involved in an interference, derivation proceeding, inter partes reexamination or inter partes review contains claims which overlap with claims of an application (original or reissue) under examination or with claims involved in an ex parte reexamination proceeding. An examiner should consult with the TC Quality Assurance Specialist to determine the appropriate course of action.